In this second round, Eric Alterman and Lizzy Ratner respond to arguments for and against BDS. Critics of BDS who call for a settlement-only boycott ignore the vast range of political and economic forces inside Israel that sustain and profit from the occupation. Before tackling all the bluster and hysteria around Boycott, Divestment and Sanctions—before diving into critics’ knee-jerk manipulations and angry accusations—let’s start with the facts: the ugly ones, the undeniable ones, the ones that have been created on the ground over six brutally deliberate decades. Let’s start, for instance, with Gaza, that locked-down, bombed-out latter-day ghetto where “refugee” has become a permanent category of existence and an endless, five-year siege has turned collective punishment into the daily norm. Let’s talk about East Jerusalem, where the native Palestinian residents are being forced from their homes to make way for Jewish settlers. 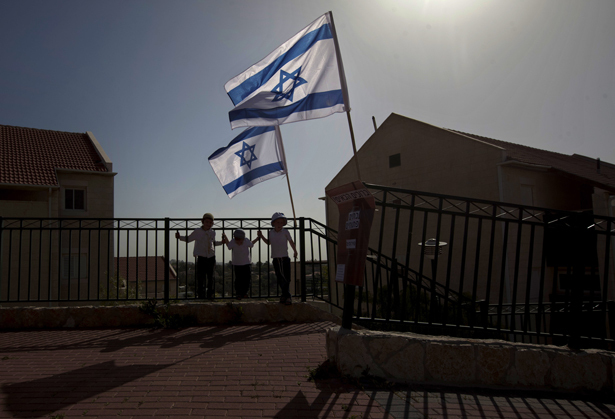 In the West Bank, illegal Jewish-only settlements hulk over a landscape denuded of olive groves. Settlers guilty of violence against Palestinians go free, while Palestinians are hauled to jail for “stealing” their own water. More than 230 kilometers of segregated roadway, and 760 kilometers of the “Separation Wall,” have convinced even the most unlikely sources that something is desperately wrong. “While the world’s statesmen have dithered, Israel has created a system of apartheid on steroids,” wrote Stephen Robert, former CEO of Oppenheimer & Company and an “ardent Israel supporter,” in The Nation last year. Finally, let’s talk about refugees, the ones who have been living in exile for decades, often in appalling conditions and have the right to return home under international law. And let’s talk about Israel itself—“democratic,” post-1948 Israel, where, despite their having the right to vote, Palestinian Israelis are subject to a dizzying concoction of discriminatory laws. Let’s talk about all of this, because this is the reality for 11.2 million people—and this is the reality from which BDS has sprung. In the frenzy to discredit BDS, it’s perversely easy for critics to forget these facts, to get lost in the abstraction (and sometimes distraction) of arguments about the uplifting effects of transnational corporations, the benevolence of 1948 Israel and the lurking anti-Semitism of the BDS agenda. These arguments are not just misleading but often downright dangerous and offensive; the anti-Semitism charge in particular is probably the most often cited and potent. So let’s be clear: vile and frightening anti-Semitism certainly exists, but BDS is not an example of it. As a nonviolent movement dedicated to human rights and nondiscrimination it is, in many ways, its opposite: the lesson of “Never Again” interpreted universally, a reminder that in the face of extreme horror, it is incumbent upon people of conscience to rally around the inalienable rights of the abused. And yet, it is precisely Avishai’s desire to force a distinction—to cordon off the outrages of the occupation, to separate reality from serious politics—that is the problem with his position. As Baum and Merav’s work makes clear, the settlements will not be dislodged through boycotts of settlement goods alone (essential, righteous and important though such boycotts are). There is a vast economy at work in keeping the settlement enterprise alive—and not just the settlements but the whole infrastructure of inequality and control that stretches in varying degrees from the southern tip of Gaza to the northern tip of the Golan. So the question must be asked, What is to be done? How do you bring justice to a system that in the last few years alone has given rise to Operation Cast Lead, the attack on the Mavi Marmara, the ongoing colonization of East Jerusalem and countless other outrages? This is where critics like Avishai once again chime in. Though it’s certainly fair to question the efficacy of BDS, Avishai makes the perplexing claim that in cutting off the salutary spigot of corporate capital, BDS risks alienating the very Jewish Israelis who are most primed to be sympathetic to Palestinians’ plight—namely, its “most educated and cosmopolitan people.” This is an odd formulation for several reasons, the most notable being the most obvious: Since when was morality the privilege of elites? And at what point did corporations become the avant-garde of enlightened behavior? Will BDS work this time around, in Israel? Israel’s leadership has certainly poured enough resources into stopping it to suggest they’re concerned. Still, we can only hope and try. Because amid all the uncertainty, the one thing we do know is that the time for dithering is long past, and the moment of peaceful, persuasive solidarity has arrived. By insisting on the right of return, proponents of BDS only undermine the progressive Israelis and Jews who would champion the Palestinian cause. As both a liberal and a pro-Zionist Jew, I’ll admit to feeling considerable trepidation whenever I check the news coming out of Israel and the occupied territories these days. There is no question that the most regressive, racist and anti-democratic elements of Israeli society have been on the upswing. Illegal settlements—judged by Israel’s own generous standards—are being justified in a hasty, ex-post-facto fashion. Laws are being introduced to reduce the freedom of debate and democratic discourse and to outlaw the work of peaceful NGOs and civil liberties organizations—who find themselves under attack by Foreign Minister Avigdor Lieberman as alleged “collaborators in terror.” Journalists’ ability to report on these matters is being hampered by draconian new slander penalties. The Supreme Court is at risk of seeing its power curtailed, and respected religious figures are calling for explicitly racist actions to be taken against Israel’s Arab minority. For instance, not long ago, dozens of municipal rabbis issued an edict against renting or selling real estate to non-Jews, and a group of rabbis’ wives joined together to instruct Jewish women avoid all contact with Arab men. What explains this destructive dynamic? Clearly a significant portion of it is driven by genuine threats combined with psychological and political factors that together produce an irrational reaction. For instance, Iran’s nuclear program, coupled with the hateful rhetoric of its leaders, has helped to empower the Holocaust-related psychosis among Jews, both inside and outside Israel, that lay barely beneath the surface of most Jewish discussions of Israel’s safety and security. According to a recent poll reported on in Haaretz, “about 40 percent of all Israelis believe the Holocaust could happen again, and 43 percent are reportedly concerned the State of Israel is in danger of being destroyed.” Another significant segment of the population are not interested in democracy or human rights but only in their extremely literalistic and restrictive interpretation of religious law. Yet another sector is comprised of right-wing nationalists who could care less about democracy and prefer to see Israel turned into a modern day Sparta. Yet even allowing for the increasing influence of these segments of society, a majority of Israelis consistently tell pollsters that they would prefer a two-state solution to the current occupation and would welcome the opportunity to work out a compromise that would end the occupation and allow Palestinians to fulfill their national aspirations in the context of security guarantees for Israel and a genuine willingness to end hostilities. But they feel themselves to be without a credible partner in the peace process and hence don’t have sufficient confidence in the concept of political and territorial compromise to challenge the scare tactics of their internal political adversaries. For this pro-peace majority to become politically empowered, Israel’s citizens must be able to trust that the Palestinians with whom they negotiate are able to enforce the agreements they reach. This is, literally, the only path to genuine Palestinian self-determination. No American president, much less Congress, will ever attempt to force Israel into a peace agreement against its will. Neither would the Europeans, who are actually irrelevant since they lack both the power and the means to do so. Terrorism aside, Palestinians have no credible military option vis-à-vis Israel. Their only hope can come by convincing Jewish Israelis that the risks and benefits of peace outweigh the risks and benefits of continued conflict. It is true, of course, that Israel’s brutal treatment of the Palestinian people breeds hatred rather than a desire for cooperation with their oppressors. Even so, it cannot possibly serve the cause of peace and self-determination for the Palestinians for their spokespeople and supporters to demand that Israel, as currently constituted, commit suicide. They may think it just. They may think it right. They may think it fair or even ordained by God. But so long as they insist, as Omar Barghouti does, on the achievement of a set of goals that would mean the end of the Zionist project, then they will only strengthen those who seek to keep them in a permanent state of oppression and immiseration as they simultaneously undermine those who would champion their cause. Barghouti claims that equal rights for Palestinians must include “at minimum, ending Israel’s 1967 occupation and colonization, ending Israel’s system of racial discrimination and respecting the right of Palestinian refugees to return to their lands from which they were ethnically cleansed during the 1948 Nakba.” If so, there is really nothing to talk about. Six or seven million Palestinians cannot be reintegrated into Israeli society based merely on arithmetic, much less all of the obvious problems that would arise from the fact that the two populations happen to hate one another. Barghouti’s conditions demand that Israelis voluntarily forfeit their commitment to their history, their national identity and their understanding of Jewish history. He might as well insist that they convert to Scientology in the bargain. Barghouti apparently thinks that the support of a food coop or an obscure pop singer somehow constitutes the beginning of Israel’s ultimate destruction. By talking in these terms and by employing the analogy of Israel not only to South Africa but also to Nazi Germany, as he has done in the past, he strengthens the case of Israel’s hardliners and actually helps to ensure the permanent oppression of the Palestinian nation. No less foolish is his mockery of those Jews who are committed to compromise, including those who support the notion of a “Zionist BDS.” By spitting in the face of the very people who are in the best position to help Palestinians progress toward the goal of statehood and self-determination, including those willing to put themselves on the line for the cause, he furthers demonstrates the disjunction between his hollow rhetoric and the political reality he allegedly seeks to influence. Finally, while I genuinely despair for Israel’s future under this unhopeful scenario, as I also grieve for the victims of its occupation, I was, however, deeply impressed to learn that Barghouti, who in effect calls for Israel’s destruction, has earned a masters degree in philosophy from Tel Aviv University. Alas, it is impossible to imagine the situation in reverse: an outspoken, foreign-born Jew who called for the boycott and destruction of the Arab or Islamic nation in which he resided living long enough to see himself denounced in the next day’s newspaper. The near-complete lack of democratic practices within Israel’s neighbors in the Arab and Islamic world, coupled with their lack of respect for the rights of women, of gays, indeed, of dissidents of any kind—make their protestations of Israel’s own democratic shortcomings difficult to credit. This is not merely a debating point. This democratic deficit also calls into question the ability of a future Palestinian leadership’s to enforce a peace agreement that is opposed—as appears inevitable—by significant segments of its population. Unfortunately, the signs from Egypt, Syria and Lebanon in this regard are hardly encouraging. Were Barghouti to ask American Jews to join him in pressuring Israel to come to its senses and negotiate a secure settlement based on the 1967 lines, with necessary adjustments on both sides and some sort symbolic (and perhaps financial) redress for Palestinians without the “right of return,” he might stand a chance of attracting significant support even among American Jews and within the Israeli peace camp. As his plan now stands, it is of a piece with the programs of Hamas and Hezbollah and with Mahmoud Ahmadinejad’s recent call for “the destruction of the Zionist regime” by peaceful means. The BDS movement is not asking for anything heroic from people of conscience. It is merely asking them to desist from complicity in oppression. Anyone who supports Palestinian self-determination while calling only for ending the forty-five-year-old Israeli occupation of the Gaza Strip and the West Bank, including East Jerusalem, is only upholding most of the rights of just 38 percent of Palestinians while expecting the rest to accept injustice as fate. According to 2011 statistics, of 11.2 million Palestinians, 50 percent live in exile, many denied their UN-stipulated right to return to their homes of origin, and 12 percent are Palestinian citizens of Israel who live under a system of “institutional, legal and societal discrimination,” according to the US State Department. More than two thirds of Palestinians are refugees or internally displaced persons. Equal rights for Palestinians means, at minimum, ending Israel’s 1967 occupation and colonization, ending Israel’s system of racial discrimination and respecting the right of Palestinian refugees to return to their lands from which they were ethnically cleansed during the 1948 Nakba. The 2005 Palestinian Boycott, Divestment and Sanctions (BDS) call was endorsed by an overwhelming majority of Palestinians because it upholds all three. By appealing to people of conscience around the world to help end Israel’s three-tiered system of oppression, the BDS movement is not asking for anything heroic. It is merely asking people to desist from complicity in oppression. Moreover, given the billions of dollars lavished by the United States on Israel annually, American taxpayers are subsidizing Israel’s violations of international law at a time when American social programs are undergoing severe cuts. Striving to end US complicity in the occupation is good for the Palestinians and for the 99 percent struggling for social justice and against perpetual war. Building on its global ascendance, the BDS movement—led by the largest coalition in Palestinian civil society, the BDS National Committee (BNC)—is spreading across the United States, especially on campuses and among churches, scoring significant victories such as at the Olympia Food Co-op. Globally, trade union federations with millions of members have endorsed BDS. Veolia and Alstom, two corporations complicit in Israel’s occupation, have lost contracts worth billions of dollars. Deutsche Bahn, a German government-controlled rail company, pulled out of an Israeli project encroaching on occupied Palestinian land. The University of Johannesburg severed links with Ben Gurion University over human rights violations. World renowned artists—including, most recently, Cat Power and Cassandra Wilson—have canceled performances in Israel, heeding the cultural boycott and transforming Tel Aviv into the new Sun City. BDS advocates equal rights for all and opposes all forms of racism, including anti-Semitism. This universalist commitment has won hearts and minds globally, triggering panic and over-the-top bullying attempts to crush BDS in the United States, as witnessed with the national BDS conference at the University of Pennsylvania and the Park Slope Co-op ballot on boycotting Israeli goods, where almost 40 percent voted for BDS. Perhaps provoked by the mainstreaming of BDS, President Obama attacked it for the first time in his recent AIPAC address, joining numerous US politicians whose vehement vilification of BDS puts them on a moral plane with those white Americans who opposed the Montgomery bus boycott and/or the boycott of apartheid South Africa. With impressive successes in the economic and cultural fields, and with the increasing impact of its Israeli supporters, BDS is viewed by Israel’s establishment as a “strategic threat” to its system of oppression—namely occupation, colonialism and apartheid. This explains the Knesset’s passage of a draconian anti-boycott law last year that drops the last mask of Israel’s supposed democracy. But multimillion-dollar campaigns by Israel’s foreign ministry to counter BDS by “re-branding” through art, science and cynically using LGBT rights to “pinkwash” Israel’s denial of basic Palestinian rights have largely failed. With its continued siege of Gaza; its untamed construction of illegal colonies and the wall in the occupied West Bank; its “strategy of Judaization” in Jerusalem, the Galilee, the Jordan Valley and the Naqab (Negev); its adoption of new racist laws and its denial of refugees’ rights, Israel has embarked on a more belligerent phase in its attempt to extinguish the question of Palestine through literally “disappearing” the Palestinians, as Said would say. Israel and its well-oiled lobby groups, who Thomas Friedman charges with buying allegiance in Congress, have been trying to delegitimize the Palestinian quest for equal rights by portraying the nonviolent BDS call’s emphasis on equal rights and the right of return as aiming to “destroy Israel.” If equality and justice would destroy Israel, what does that say about Israel? Did equality and justice destroy South Africa? Did they destroy Alabama? Justice and equality only destroy their negation, injustice and inequality. The BDS movement’s effective challenge to Israeli apartheid and colonial rule petrifies Israel and its lobbies. Desperate to “save Israel,” essentially as an apartheid state, and motivated by genuine fear of the demise of Zionism, “liberal” Zionists are under exceptional duress given the fast spread of BDS. Cognizant of its appeal to an increasing number of younger Jewish activists, some are muddying the waters by suggesting a Zionist-friendly boycott to undermine the movement. But BDS is an ethically consistent, rights-based movement that cannot coexist with racism of any type, including Zionism. A “Zionist BDS” is as logical as a “racist equality”! BDS addresses comprehensive Palestinian rights, not simply ending the Israeli occupation of some densely populated Palestinian territory in order to save Israel as a “purer” apartheid. Even those who seek ending the occupation only, disregarding the basic rights of most Palestinians, struggle to explain their opposition to a full boycott of Israel, the occupying power, which under international law bears full responsibility for the occupation and its manifestations. The BDS movement calls for boycotting Israel just as South Africa was the target of boycotts due to its apartheid regime, China due to its occupation of Tibet and Sudan due to its crimes in Darfur. Still, BDS is not a dogmatic or centralized movement—it is all about context sensitivity and creativity. BDS supporters in any particular context decide what to target and how to mobilize and organize their local campaigns. So long as they uphold the basic rights of all Palestinians, international partners may decide to selectively target companies implicated in Israel’s occupation or colonies only out of pragmatic considerations rather than approval of Israel’s other injustices. A movement that dwells in citizens’ consciences, that is rooted in an oppressed people’s heritage of struggle for justice, and that is inspired by the rich and diverse legacies of Nelson Mandela and Martin Luther King, Jr. cannot be defeated or co-opted. Our South Africa moment has arrived. A boycott of Israel’s settlements makes sense, but a broader boycott will most hurt those forces inside Israel that are best poised to change Israeli state policy. The American response to Peter Beinart’s New York Times op-ed calling for an economic boycott of Israel’s West Bank settlements—what he calls, usefully, “non-democratic Israel”—will strike Israeli liberals as just a little melodramatic. Not very much is produced in the settlements, which are largely bedroom communities. Most liberal Israelis have been boycotting products from the settlements for years: Dead Sea creams, organic eggs, boutique wines and spices. Recently, various scholars, artists and scientists signed statements announcing our refusal to cooperate with, or even visit, the college established in the settlement of Ariel, between Ramallah and Nablus; a college originally established by Bar-Ilan University, but now applying—with the support of Netanyahu’s government, and in the face of considerable opposition from the Council of Higher Education—to be upgraded to an independent university. A couple of years ago, writing against the BDS movement against Israel as a whole in these pages, I called for just such a boycott myself. And Beinart is right to want the boycott of settlements to be international. Presumably, this will pressure Israeli companies, too, into dissociating themselves from the settlements and, in some cases, proving that they are not using settlement components or raw materials. The Israeli right wants to establish facts to erase the boundary between Israel and the occupied territories. A boycott of settlements establishes counter-facts that reinforce an eventual boundary: about a fifth of Israel’s GDP is from exports, and any serious Israeli company is global. But the settlement boycott has another virtue, which is to bring into relief the kind of boycott that should not be entertained, namely, a general boycott of all Israeli products and institutions. That boycott would erase another boundary, between the Israeli state per se—the country and its civil society—and the state apparatus under particular elected leaders. Erase that boundary, and you erase the discrete facts of Israeli politics; you repudiate the idea that a more moderate government could ever be elected again, though polls show that a split in the Shas party, or the emergence of a charismatic centrist, or a shift in Israeli Arab electoral strategies (all of which, or none of which, may happen this year), would tip the Knesset and government back to what it was under Ehud Olmert, who just attended the J Street conference, by the way. Israel, in other words, is a complicated place. Its democracy is certainly more than what produced the occupation of Palestine. Imagine European officials, intellectuals etc., reading grim headlines about America’s invasion of Iraq, and concluding that the war was the product (as it was to some degree) of America’s imperial political structure and peculiar concepts of liberty. Imagine their advocating a boycott of everything American, from Google, to The Nation, to Berkeley—in effect, an end to the United States as we know it, including Bush’s internal opposition. Would this have been thought sane? To be sure, Israeli democracy is not what it could be. I defer to no one in having risked what writers risk to tell hard truths about it. I wrote in The Tragedy of Zionism, nearly thirty years ago, that settlements were only the most vivid proof of Israel’s democratic deficiencies; that some of its legal structures amounted to discrimination against Israeli Arabs and valorization of religious orthodoxy—more precisely, reflected the absence of a liberal social contract needed to allow all citizens to meet as equals. And, yes, Israeli state agencies and the IDF have been instrumental in making the occupation what it is. Still, Israel is also a place of progressive and creative forces, concentrated in Israeli elites: again, artists and scholars, but also entrepreneurs and professionals. BDS aims to hit global companies doing business with Israeli ones. But, as a group, international companies are the most important allies Israeli liberals have. These companies are learning and teaching organizations: Intel’s impact on Israel is like MIT’s on Cambridge. Opposing the bloc of parties favoring Greater Israel is a (somewhat weaker) bloc working toward Global Israel. What would BDS do to the latter, the very people in Israel whom the liberal world needs to strengthen? You see, the implicit premise of BDS is that the occupation flows from the fact of Israel itself: that Israel is inherently a kind of occupation machine, beginning with 1948 and followed by 1967. In effect, BDS advocates accept the grotesque view of settlers and Hamas both, that the claim of Jews to Hebron in 2012 is exactly like the claim to Degania in 1912. It is not: the actions of a desperate movement are not to be copied by a triumphant state; after he became mayor, Jean Valjean did not keep stealing candlesticks. On the other hand, BDS advocates argue that the stock of global companies making things used by occupation forces—United Technologies makes IDF helicopters, for example—should be divested, as if companies are big collaboration machines. But the same company’s air-conditioners may be cooling a school in Afula—or Gaza. In both cases, looking at Israel, or at companies, we need to up the magnification. Some will say, fine, force the implosion of Israel’s private sector and this will finally force Israeli elites to seek political change more urgently. This is mechanistic and shortsighted thinking. Economic implosion, which a fully implemented BDS would bring about rather quickly, will cut the ground out from under Israel’s most educated and cosmopolitan people. It will not just pressure them, it will destroy them—ruin their lives, force the emigration of their children. Settlers and their ultra allies, in contrast, have no problem with Israel turning into a poorer, purer, Jewish Pakistan. Do we really want to cause Israel’s private sector to collapse or its universities to be isolated? I suppose what offends me most about BDS is that it confuses anger with serious politics. It is something like the Tea Party, mad at “government,” too righteous to distinguish baby from bathwater. What we need, rather, is a vibrant, globalizing Israel, businesses, universities, etc. that expect to be part of the world and show the way to it; people who find Greater Israel an embarrassment and, indeed, will see an international boycott of settlements as a way of selling their case for compromise. Such people will be strengthened not by BDS but by a general, persistent anxiety about the conflict’s “opportunity cost”: the conviction that Israel’s manifestly improving quality of life will be a far cry from what it could be with peace. That is the vision a re-elected President Obama should be preparing to bring: for Israel’s security everything, for Israel’s occupation nothing. That is the vision he tried to bring before 2010’s electoral reversals spooked all Democrats into the arms of AIPAC. With the Palestinian Authority on the brink of collapse, and successive Centcom commanders warning of a mean turn in the Arab street if the settlements are not stopped, is it too much to hope that the embrace is not permanent? Omar BarghoutiOmar Barghouti is a Palestinian human rights defender and co-founder of the Boycott, Divestment and Sanctions (BDS) movement for Palestinian rights. He is co-recipient of the 2017 Gandhi Peace Award.